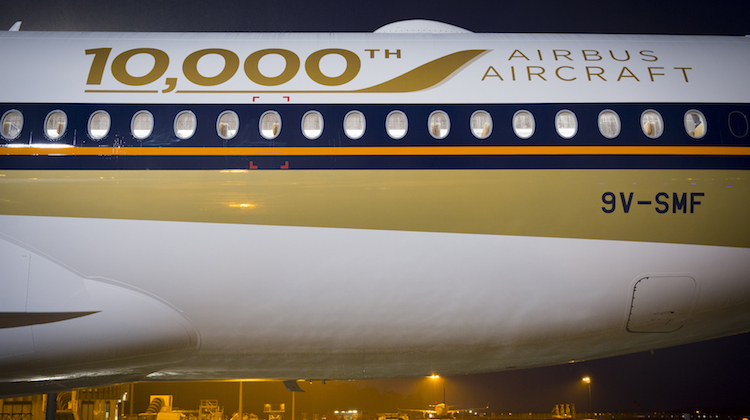 Some 42 years after the company delivered its first aircraft, an A300 to Air France, Airbus has handed over the keys to its 10,000th airframe, an A350-900 to long-time customer Singapore Airlines (SIA). 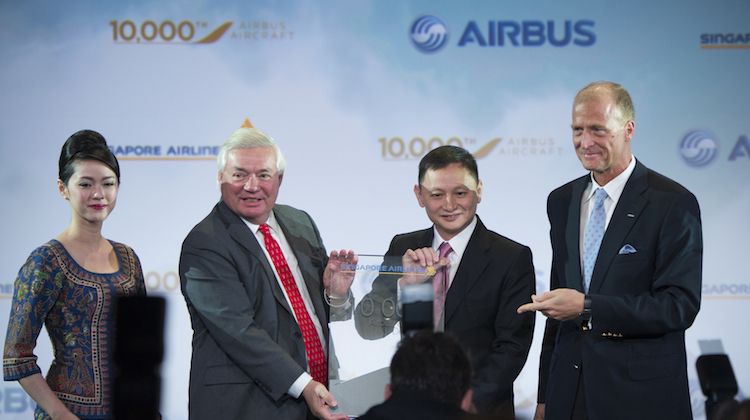 The milestone event took place at Airbus headquarters in Toulouse on Friday (European time), with the ceremony attended by SIA group chief executive Goh Choon Phong and Airbus top management, along with invited media and other guests. 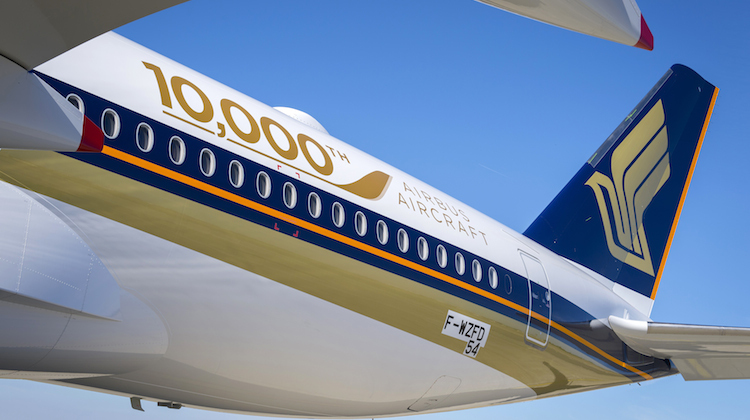 The A350-900 MSN 56 9V-SMF, featured a special 10,000th aircraft logo on the fuselage and is SIA’s sixth of 67 A350s the Star Alliance member has on order. 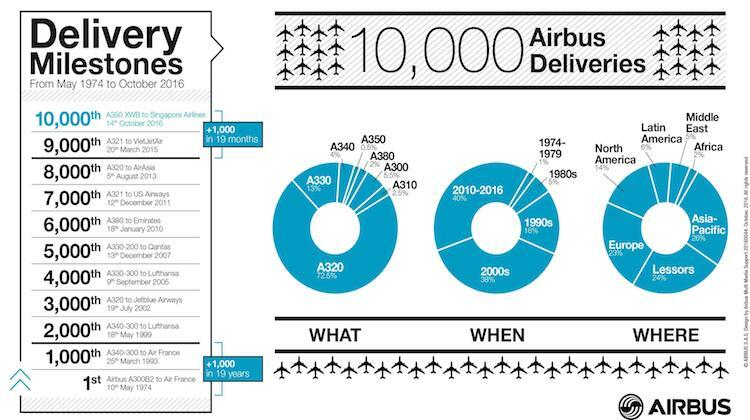 In a sign of how much the manufacturing process has changed over the past four and a bit decades, Airbus said it took 19 years to deliver its first 1,000 aircraft. By contrast, aircraft 9,001 to 10,000 were delivered in a period of about 19 months. 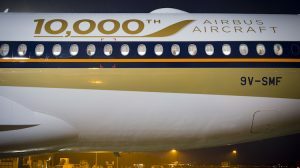 Further, Airbus said it expected to deliver its 20,000th aircraft in about a decade. This represented about “one fourth of the time to produce its second 10,000 jetliners as compared to the first 10,000”, Airbus said. “Since our earliest days innovation has been at the heart of everything we do at Airbus,” Airbus Group chief executive Tom Enders said in a statement. SIA has operated every model of passenger aircraft Airbus has produced and today has the A380, A330-300 and A350-900 in its fleet. The airline group’s regional wing Silkair operate a number of A320/A319. However, it is phasing out those aircraft in favour of Boeing 737 narrowbodies. And SIA’s low-cost unit Tigerair Singapore flies A320s. 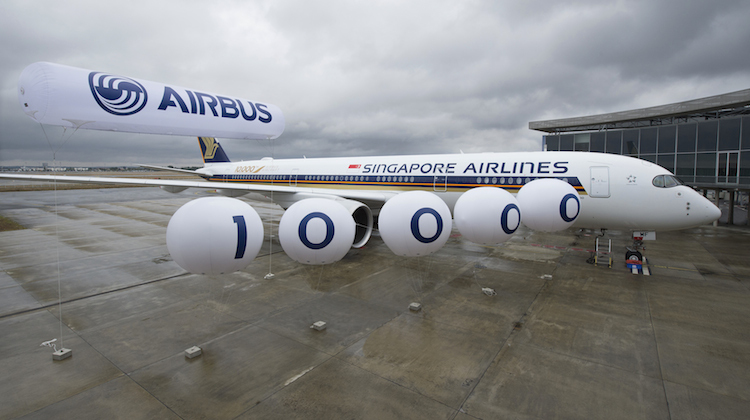 “Singapore Airlines is honoured to be receiving the 10,000th aircraft that Airbus has delivered,” SIA chief executive Goh Choon Phong said in a statement. “Airbus aircraft have contributed greatly to Singapore Airlines’ successes over the decades, and we are proud to be sharing this important milestone with our longstanding and trusted partner. Figures from Airbus showed that of the 10,000 Airbus aircraft delivered since the May 10 1974 handover of an A300 to Air France, 72.5 per cent have been narrowbody A320 family aircraft, while A380 was responsible for two per cent of all deliveries, the A330 13 per cent and A350 about half a per cent. Among models no longer in production, Airbus said 5.5 per cent were A300s, 2.5 per cent were A310s and four per cent were A340s. Airbus executive vice president – head of programmes Didier Evrard said the company was determined to keep improving the passenger experience and operational performance of its aircraft. “Our desire to further transform the industry is undiminished,” Evrard said. “We will continue to improve environmental performance, reduce noise, develop new services and enhance operational capabilities. “We’ll strive to stay at the forefront when it comes to connected aircraft, passenger comfort, and adopting disruptive technologies”.